The most awaited grand sale in the city is happening again as SM City General Santos kicks off their 3-Day Sale on March 18 to March 20, 2016 with up to 70 percent discount on great finds. On March 18, from 10:00am-12nn, all shoppers with SM Advantage Card (SMAC) can avail 10 percent discount on the top of existing promo on all items from The SM Store, SM Appliance Center, Surplus, Toy Kingdom, Watsons and Ace Hardware. 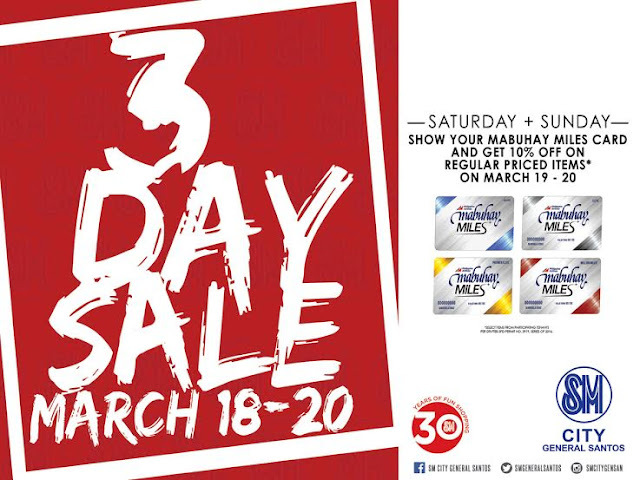 Show your Mabuhay Miles Card on March 19 until 20 and get 10% off on all regular-priced items from participating tenants. 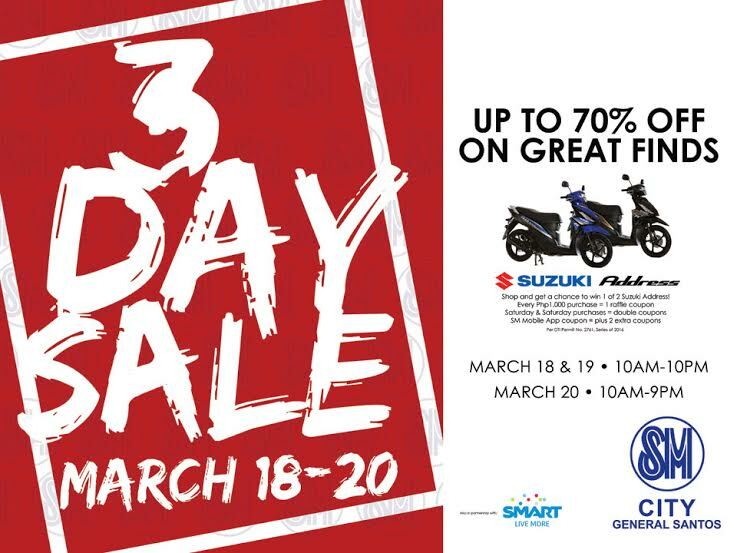 There is still great deal for this 3Day Sale, for every P1000 single or accumulated purchase on July 31 to August 2 from any establishment of SM City General Santos, each shopper shall have one raffle entry and a chance to win TWO brand new Suzuki Address Motorcycle. A shopper can have one raffle coupon for every 1, 000 purchase and double coupons on Saturday and Sunday purchases. All these and more as the city’s leading community and shopping destination offer you a total mall 3Day-sale experience! 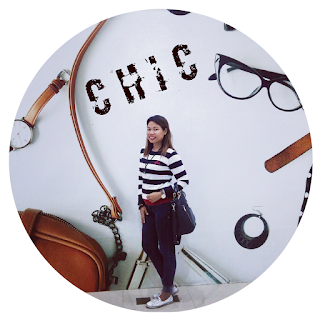 See posters and print ads for details! For mall and event updates, check-out SM City General Santos (Official) on Facebook, follow @smcitygensan on Instagram or call (083) 878-0667.